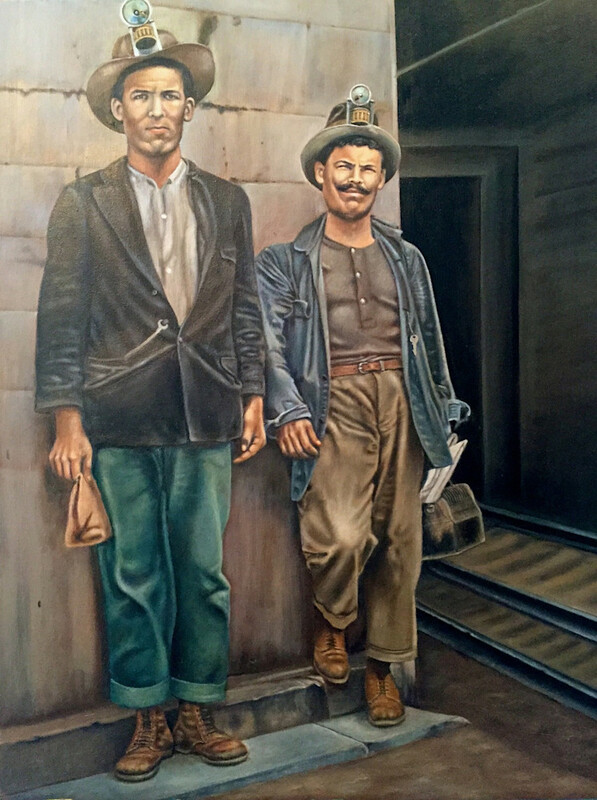 This painting was created from a 1930’s picture of brothers Santiago Vasquez and Juan Vasquez as they are taking a lunch break at the Phelps Dodge Copper Mine in Jerome. Arizona. This 22” x 28” oil painting, “Jerome Copper Miners”, was painted by Rosemary Vasquez Tuthill. The painting was created from a 1930’s picture of brothers Santiago Vasquez, Rosemary’s grandfather, and Juan Vasquez as they are taking a lunch break at the Phelps Dodge Copper Mine in Jerome. Arizona. The city of Jerome was founded in 1876 in the Arizona Territory. In the 1920’s the population peaked due to the copper mines and the copper demand. At its height, Jerome mines produced 3 million pounds of copper per month. The Depression of the 1930’s slowed mining operations up until World War II which increased copper demand and following the war, demand slowed to the point of the Phelps Dodge Copper Mine closing in 1953. Origianal size 28x22.